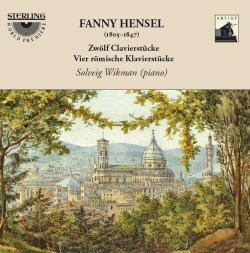 The music of Fanny Hensel, or Mendelssohn, has been going through something of a reappraisal over the last few years. A number of record companies have released fine discs of her music, which is gratifying to see. She has too often been seen as riding on the coat tails of her more illustrious brother, so to be able to hear her music in its own right is good. Often regarded as being as gifted as her younger brother, Felix, she was given equal opportunity to learn as he was by her parents. It was also instilled into her that no woman of her position and status should perform in public. She was therefore restricted to performing her own compositions at private concerts in her own home. Her husband, the painter Wilhelm Hensel, supported her as a composer and pianist and would often illustrate her manuscripts, which also bore short pieces of descriptive poetry. Fanny went on to compose over 560 pieces, with the Piano Trio being the most famous. She also composed an oratorio and songs, some of which had been included as part of collections originally published by her brother. During her lifetime only a few pieces of her music were ever published. This was partly down to the lack of support by both her brother and father, however her husband thought she should publish her works and he helped her in this. In 1843 Fanny drew together a series of twelve piano pieces, many of which were composed much earlier, and sent them to her brother, it has been suggested, as a birthday present. Many of these pieces have a song like quality and recall the Songs Without Words of Felix. There is even an obligatory Gondolier-inspired piece, the sixth in the collection, the Serenata (Gondelfahrt). For me it is the third piece, the Allegro molto vivace ma con sentimento, which is the highlight of the set. It is also the longest, and is more akin to the music of Chopin than that of her brother. This is a very important and attractive book of piano pieces, one that fits in well with the romantic sensibilities of the day. The Vier römische Klavierstücke draw together four pieces that were composed during a happy and fruitful visit to Italy including Rome in 1840. In these pieces, especially the second and third, Fanny develops the music more. These are no mere Songs Without Words, rather here we have a composer who takes the format and shapes it to suit her own needs. These are some of the most powerful and rewarding of her piano works that I have heard. They are a must for all lovers of mid-nineteenth century romantic piano music. Solveig Wikman plays her Bechstein E Grand Piano very well indeed, despite the size of the instrument; it is the largest that Bechstein make. She treats it with a lightness of touch, when required, so that the character of each piece shines through. Wikman presents most intelligent and thoughtful interpretations, proving to be an excellent interpreter, and one who makes me want to hear her perform more music by Fanny Hensel. The recorded sound is good and faithful to the piano, and the disc come with excellent booklet. The line-note is by Solveig Wikman herself and in it she not only gives us biographical details, but also descriptions of each of the works presented.